To create a presentation folder that is perfect for your business, and the message you want to convey, design and concept are key. A pocket folder can be simple and elegant, with maybe a foil logo, or it can be a high color, glossy, “jump off the page” design. Whatever your business image or philosophy, it should be easily seen right on the folder. Adding your contact information is also very important and normally is seen on the pocket or back of the presentation folder. Both are great areas to put important information. Budget is always an issue; however, you will find that a good printing company will give you options that can fit into all budgets. Presentation folders are an investment in your customers, and the payoff for the cost can be more customers, and even more profits. Retail and hospitality oriented businesses are constantly trying to figure the right way to market and grow. Whether they need more sales, customers, or other goals, choosing how to get a message out to prospective and current customers, in the right way, can be challenging. Many businesses trend towards the same marketing style and over time this become ineffective. Sending the same materials over and over not only wastes money, but the collaterals tend to be thrown out and completely ignored. Businesses need to try fresh concepts and ideas to obtain results, and one great marketing push to try is a key tag loyalty program. Key tag printing has been around for a while; however, businesses are a little intimidated to try and begin one; or maybe they are just not sure which type of program they should use. The fact is they can be very easy. Even for a small mom and pop shop that has very limited resources can take advantage of what key tags can do for their business. They are the perfect way to keep customers reminded daily of your business and even incite them to purchase more than normal. By opting for a barcode on the key tag, a business can track every customer that uses their tag and offer rewards based on purchase price, or even offer a discount at checkout with their key tag. Decide what your business wants to offer. Do you want to just track customer usage, or do you want to offer a discount with each use? What is your budget for your program? Make sure you factor in the cost of designing your piece, printing and how you are going to get the key tag into your customer’s hands. Next, which style works best with your goals? Do you need a card and a key tag(s), or just a single key tag? Do you want to track with a barcode right on the card or key tag, or will you use a different method, like manually entering a number or discount. Although the process can seem a bit overwhelming, it doesn’t have to be. Researching programs on the web is a great way to get ideas, and most reputable key tag printing companies offer pricing, templates and other information online saving you tons of time. No matter what the budget or experience, a business can create a great key tag loyalty program that gets results without breaking the bank. Loyalty key tags are a great way to keep track of customer information and behavior while also offering them discounts and specials when they use their custom key tags. Several retail and service-based businesses, from grocery stores to craft retailers, are using these types of loyalty programs. Because of the wide variety of options that come with a custom key tag, it is possible for an automotive shop to create a loyalty program as well. An automotive shop can make it possible to track customers’ car repairs and history, as well as offer them loyalty programs on regularly scheduled services, such as tire rotations or oil changes. For instance, it may be worthwhile to offer a free oil change for every ten oil changes a customer purchases at one automotive tire & lube shop. The loyalty key tag program can also send customers personalized coupons and recall or safety information targeted to their demographics, service history, and vehicle make & model. Many customers would appreciate being alerted when their vehicle has a recall. This is also a good opportunity for the automotive shop to offer to repair or replace the recalled component, giving the customer peace of mind and the ability to get back onto the road safely. Automotive key tags should include the business’ logo, as well as an automotive design, such as an engine, car clip art, or other types of related artwork that would relate easily. Most well-designed key tags either have graphics completely filling the front of the key tag or have their logo on a solid color background, such as black or blue. Choosing a background color that is related to one of the business’ logo colors can give an overall cohesive feel and design. Adding a barcode to the back of the key tag will allow you to scan, and keep track, of customer loyalty. Key tags should also be easily identifiable, as most customers have a few key tags on their key ring at once. A great key tag printing program can not only increase business, but help your automotive business provide excellent customer service and incentives. What Are The Different Styles of Parking Permits? Parking permits come in two different styles; outside the vehicle or inside the vehicle. We produce both styles at My1Stop.com each with different materials for various applications. Outside the vehicle parking permits. You see these all over the place. Usually oval or square in shape, they come in two different types of materials reflective and reflective destructible. Both materials are durable, designed specifically for custom parking permits and when subsurface printed (our unique specialty) they will stand up to almost any temperature and moisture extremes. The materials differ in their removal qualities. When any attempt is made to remove reflective destructible parking permits, the entire permit flakes apart, making it impossible to be re-used. Non destructible reflective material leaves no trace when removed and has no adhesive left to make the parking permit reusable. As you guessed, most parking permits are not meant to be reused. This makes it very difficult – if not impossible – for unauthorized use of parking permits. Inside the vehicle parking permits. These come in three flavors; hang tags, window clings and mirror decals. The most popular type of in-vehicle parking permits are window stickers. These window clings have a permanent, non reusable adhesive that is impervious to heat, cold and moisture. You see these all the time, usually in the lower right or left side of the front window. This is the best bet for issuing parking permits that last and are almost impossible to steal or alter. Hang tags are the most popular form of temporary or reusable parking permits. These PVC tags simply hang from the rear view mirror post. They are readily visible, durable and ultimately reusable. Window clings can come with or without adhesive. Huh? Some window cling are static cling – making them reusable; however, they are suggested for temporary use only. This type of parking permit is so easy to remove and reuse that they invite abuse for anything other than temporary conditions. Lastly, mirror decals offer a lot of the advantages of window clings – though they can be messy to remove from the plastics typically used in rear view mirrors. As a result, these are the least popular type of in-vehicle parking permits. When you’re ordering or designing parking permits, just let me know and I’ll get you some free parking permits samples from customer service. Be sure to give them a call once you have your samples in-hand! 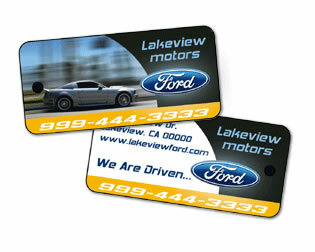 Your Plastic Cards And Key Tags Snap Out Of A Direct Mail Postcard! Really. Direct mail postcards are morphing into mailable plastic pieces! Plastic postcards let you add plastic cards and key tags that punch right out of your postcards. Cool. This is an amazing effect that really pumps up customer response to direct mail. Plastic postcards with snap out plastic cards and key tags also cut costs – and material consumption – in big ways while giving you tremendous new features. Many businesses are housed in a multi-tenant office building, in an office park, or even a technology campus. Having a large number of people in one place at one time can present problems for business when it comes to parking. Who belongs in your parking lot or in your assigned parking? What if the office building or office park you are working in has a parking garage? How do you ensure that your employees or guests won’t be towed? These are issues that arise not only for building management or property management companies, but for businesses as well. One way to address these concerns is through the use of parking permits. By instituting a parking permit program, business can do more than simply monitor parking privileges. As companies invest time and money into improving their corporate infrastructure, as well as safe-guarding their staff, the use of parking permits serves as a vital piece of an overall security initiative. Additionally, parking permits are also public facing – your company’s name and brand is part of the permit, and will be visible to passers by wherever your employees travel. This means that having professional quality parking permits is a serious consideration. The permits not only reflect the importance of your organization’s security, but also reflect the company’s image. There are a variety of materials and configurations available for parking permits. The use of the parking permits will help you to determine which parking permit solution is the best fit for your program. With the assortment of colors, materials, finishes, and configurations available, it’s easy to perfect your parking permit program. There is a lot of talk about whether direct thermal or thermal transfer printing is the better choice for your tags and labels. You may get different answers depending on who you speak with. However, it really depends on your individual needs. Direct thermal printing involves the direct application of the heated print head to a specially treated paper. Once the heat is applied, the image is then burned directly onto the paper. Many people prefer direct thermal printing because it does not use ribbons. On the other hand, the special type of paper that is used is not very durable and does not last long. It is similar to fax paper. Over time the paper will fade and start to discolor. Direct thermal printing is best for short term use, like shipping and packaging labels. On the other hand there is thermal transfer printing. This type of printing requires a ribbon. In thermal transfer printers, the heat of the print head transfers the image through the wax and/or resin ribbon to your label. As opposed to direct thermal printing, the image on your label or tag will last for years. If your label is going to be exposed to the outdoors or constantly changing elements, thermal transfer printing is the way to go. We’ve all heard the Ford and Chevy jokes, right? We’ve all seen the bumper stickers in the back windows of big pick up trucks. Most people are loyal to their brand of automobiles because it was their first car or because they have had good luck with that certain brand. Plastic card printing can be cost effective for you and if done correctly can keep your customers coming back. One of the best ways to do this is with a well conceived print marketing campaign. In the increasingly competitive automotive industry, how do you make your dealership stand out from the crowd? How do you keep your customers loyal to your dealership? In more instances you will find that a high level of customer service is the top answer to both of these questions. While you can provide great customer service when your customer is in your dealership, you must ensure that he/she is always thinking about you in a positive way. One of the best ways to do this is with a well conceived print marketing campaign. A great way to start this is with a mail campaign that looks professional and is beneficial to your customer. 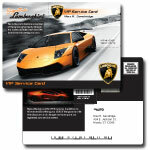 Plastic postcard printing can be cost effective for you and if done correctly can keep your customers coming back. Plastic cards are durable and easy to carry. While there are hundreds of uses for plastic cards, the below are just a few to get the ball rolling. When purchasing an automobile, customers are very brand loyal. There are a number of places they can choose to purchase those brands. By reaching out to customers and potential customers, you can ensure that these people will have you in mind when making their next purchase.